Item Description: “Yankee Deserters” (editorial), The Daily Journal (Wilmington, N. C.), 9 July 1864. We learn that some forty-two deserters from GRANT’S army arrived here last night under guard from Petersburg. We have a word to say about these people who come as deserters from the LINCOLN army, and are employed on any of our works, public or private, and we shall say it briefly :—To the best of our knowledge and belief, experience and observation, they would be more properly designate as Yankee emissaries, sowing the seeds of discontent and dissatisfaction among our own people, availing themselves of every opportunity to corrupt our negroes, and sooner or later contriving to get off again to the enemy with all the information they may have been able to glean. The policy of employing them at our railroads or other works does not appear to us to be at all a doubtful one. We, at least, have no doubts at all upon the subject. We regard it as not only dangerous, but certainly and positively injurious. We have no hesitation in saying that the policy is a wrong one, and ought to be discontinued. P. S. Since the above was written, we have been informed that the forty-two Lincolnites brought here to-day are not deserters, but prisoners captured on the line of the Petersburg and Weldon Road, and that they are about the hardest and most motley human crowd that can well be imagined. This, however, does not detract in any way from the truth of our remarks about the employment of deserters or allowing them to circulate at large in any of our communities. We repeat, they must be regarded and ought to be treated as emissaries, ultimately to become spies. 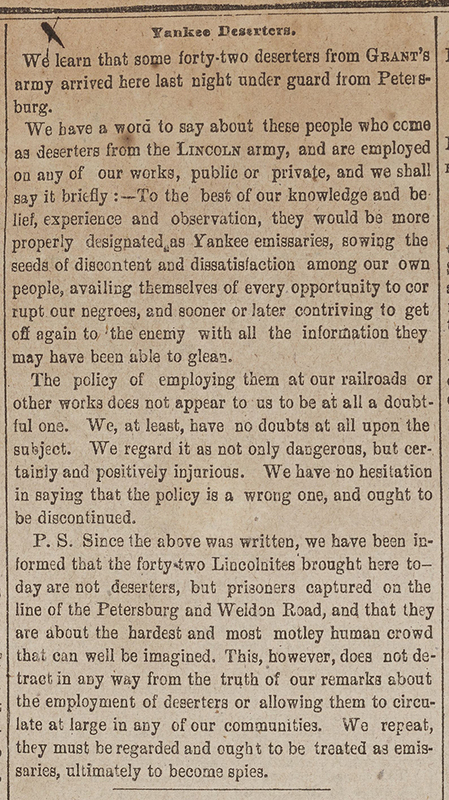 Item Citation: “Yankee Deserters” (editorial), The Daily Journal (Wilmington, N.C.), 9 July 1864, page 2, column 2. Call number C071 W74j, North Carolina Collection, Wilson Library, University of North Carolina at Chapel Hill. This entry was posted in North Carolina Collection and tagged deserters, Petersburg Weldon Railroad, prisoners, spies. Bookmark the permalink.